This antique gas station sign is a circle. The circle pictures a yellow-bordered shield. Prominently displayed on the shield is the Richfield eagle logo. 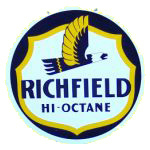 “Richfield / Hi-Octane” is printed in blue letters below the eagle.